Indications: Roundworm, threadworm, tapeworm, pinworm, hookworm, ringworm, amoebae, microscopic parasites and parasitic larvae, eggs, Shigella, Staphylococcus and Streptococcus. What are the Symptoms of Parasites?Getting rid of all parasites would be absolutely impossible using clinical medicines that can kill only one or two parasites each. Such medicines also tend to make you quite ill. Imagine taking 10 such drugs to kill a dozen of your parasites! Parasites are a problem not only for third-world countries; studies have shown they are also a major problem in the UK and USA. One study found that 32 percent of people tested positive for parasites especially in households where cats and dogs are present. Though parasites are unknown to their hosts, they can lead to a multitude of health problems because they emit toxins that can overwork vital organs such as the kidneys and liver. This can lead to fatigue, weight gain, irritability, and more. How do I know I have parasites? 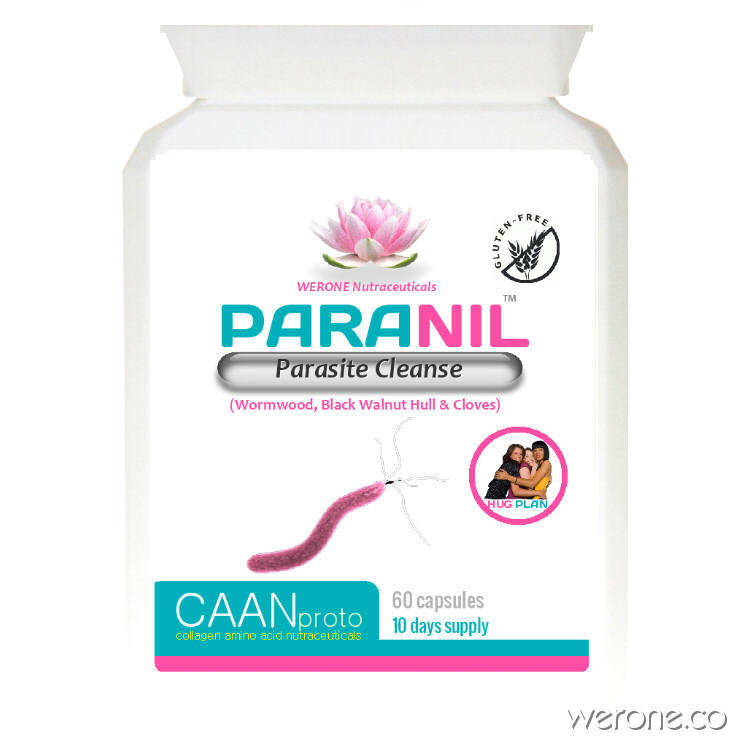 Paranil Parasite Cleanse contains the three main elements of Dr Hulda Clark’s world-famous parasite cleansing herbal formula; black walnut hull, clove and wormwood, but also contains additional ingredients, some of which are also common to Markus’s Parasite FREE formula such as Butternut Bark, Papain and Garlic. They are traditionally used to help rid the body of parasites. Each Paranil bottle contains a 10-day supply. Diatomaceous Earth for Candida, Digestive Enzymes should also be used in conjunction for a complete cleanse in order shown in the diagram. For a more complete removal of parasites, follow the routine shown in the diagram, you will need a few bottles to complete the course. Used by the Indians of America as an anti-parasite, anti-bacterial, anti-viral and anti-fungal remedy. Its active ingredients are juglone, tannin and iodine. The hulls of the black walnut kills the adult stages of the parasites. Known for its vermicidal properties and helps those with a weak and under-active digestion. It increases the acidity of the stomach and the production of bile. The wormwood capsules kills the larval stages of the parasites. It is most effective against roundworms, hookworms, whipworms and pinworms. Wormwood contains the potent chemicals thujone and isothujone, which are the primary components that kill parasites. Wormwood also contains santonin, an effective remedy for parasitic diseases. Anti-parasitical, anti-fungal, antiviral and anti-inflammatory properties. It also removes pain. The cloves capsules removes the parasite eggs. Cloves contains the most powerful germicidal agent in the herbal kingdom known as eugenol. It also contains caryophyllene which is powerful antimicrobial agents. These components travel through the bloodstream, killing microscopic parasites and parasitic larvae and eggs. Cloves also destroy all species of Shigella, Staphylococcus, and Streptococcus. Please see our detox page for Liver and Kidney Cleanses. Garlic is able to slow and kill over 60 types of fungus and 20 types of bacteria, as well as some of the most potent viruses. Garlic has a history of killing parasites and controlling secondary fungal infections, detoxifying while gently stimulating elimination, and has antioxidant properties to protect against oxidation caused by parasite toxins. The active components in garlic that kill parasites are Allicin and Ajoene. These compounds can kill amoebas including one-cell varieties, as well as pinworms and hookworms. Allicin is not present in garlic in its natural state. When garlic is chopped or otherwise damaged, the enzyme allicinase acts on the chemical allicin converting it into allicin, the active component contributing for its success for killing parasites. Cranberry (11% extract), Garlic Extract (1.2% allicin), Apple Pectin Powder, Black Walnut Hull Powder, Carrot Juice Powder, Papaya Fruit Powder, Pau D’Arco Powder, Wood Betany Powder, Butternut Bark Powder, Cloves Powder, Wormwood Powder, Oregon Grape Root (10:1 extract), Blueberry Leaf (22% extract), Golden Thread (20% extract), Goldenseal 5% extract) and Echinacea Angustifolia Powder. PARANIL PARASITE CLEANSE‘ herbs and Diatomaceous Earth (DE) for Candida should be used together but as separate ingredients. Only if you use them together will you rid yourself of parasites along with the Liver, Kidney and Metal Cleanse (Zeolite) according to the diagram above. If you kill only the adults, the tiny stages and eggs will soon grow into new adults. If you kill only the eggs, the million stages already loose in your body will soon grow into adults and make more eggs. You will benefit from taking Betaine HCL and Digestive Enzymes with every meal. This is also a super important part of cleansing, supporting your body and lengthening your life. Each bottle contains a 10-day supply. For a more complete removal of parasites ensure you do at least a 20-day UNINTERRUPTED cleanse to ensure that eggs are also expelled too. As a dietary supplement, take two (2) capsules with food, preferably probiotic yogurt, three (3) times daily for ten (10) days along with Diatomaceous Earth and Aloe Vera. STAY ON THIS FOR 20 days! Adult parasites leave eggs behind when they die. It takes time to rid your body of all stages, up to 12 weeks in extreme cases. Take probiotics at the end of the day because PARANIL is very powerful can reduce healthy bacteria too. Take some sort of fiber during cleanse, also colon cleansing (drinks or enemas) is recommended to flush out the dead parasites. Do NOT feed the parasites ! This means NO bread, pasta, sugar, dairy, meat, sushi, cereal, baked, processed or fast foods. Garlic, cucumber, carrots, pomegranates, pumpkin seeds, sunflower seeds, papaya, aloe vera, cayenne pepper, mint, coconuts, pineapple. Turmeric is an anti-inflammatory wound healing worm-expelling body purifier. I wasn’t sure if I had any parasites, but I gave this a go anyway. There is definitely a cleansing going on in my digestive tract. Before I took the Parasite Cleanse, my tummy was bloated most of the time, but now that’s gone and my tummy generally feels better. I would buy it again. Cleanse your body…feel clearer. A high quality product. Potent herbal product for clearing the body of parasites. The cleanse worked quickly and effectively, and although I have not yet finished the bottle, I do feel different:- clearer, less cravings for food that I know is not good for me, I feel like eating less (doesn’t that make you squirm to think what the parasites enjoy courtesy of you?). I recommend buying this product. Some other manufacturers make very weak herbal products with a lot of fillers and charge more than here. I was feeling tired even though i was eating well and taking supplements. Had never heard of a parasite cleanse let alone tried it! While researching on the internet i discovered it! Also, this year having travelled to India and becoming very ill there I thought there was a possibility of parasites. On day 2 I thought i was going to pass out while at the gym. I felt so nauseous. I was going to stop taking tablets but read on the internet that if you had such symptoms it was probably parasites causing this. I decided to continue and i am so glad i did. On day 7 now and to my horror and disgust I noticed a worm in my poop. I can also say i have so much more energy already. I will definitely make this an annual thing to do!! Great product. Already completed 2 courses. Easy to take. Experienced some die off. Benefits so far – no more aching joints, less tired, no longer feeling cold or hungry, better mood!!! Hands and feet no longer cold! Got parasites from extensive world travel / working with young children/ general life. Doctor denied I had parasites – he was wrong. Many symptoms I would have never even associated with parasites. Did extensive research and chose this one. Really good product, I have had fantastic results so far. I do not have intestinal parasites, but developed a skin parasite after a trip to the US. It has had Doctors baffled. I used the product as part of a serious detox, but noticed a massive depletion of symptoms doing the cleanse, and so far it has worked better than anything I have tried. I intend to use it again.